Ya se vienen las fotos del desfile tan pronto como sea possible…. Besos a todos mis queridos lectores, cada vez vamos aumentando las visitas, Quiero agradeceros desde el fondo de mi corazón, sin ustedes esto no sería possible Gracias por vuestro apoyo, y por sus buenos deseos me hacen muy Feliz!!! 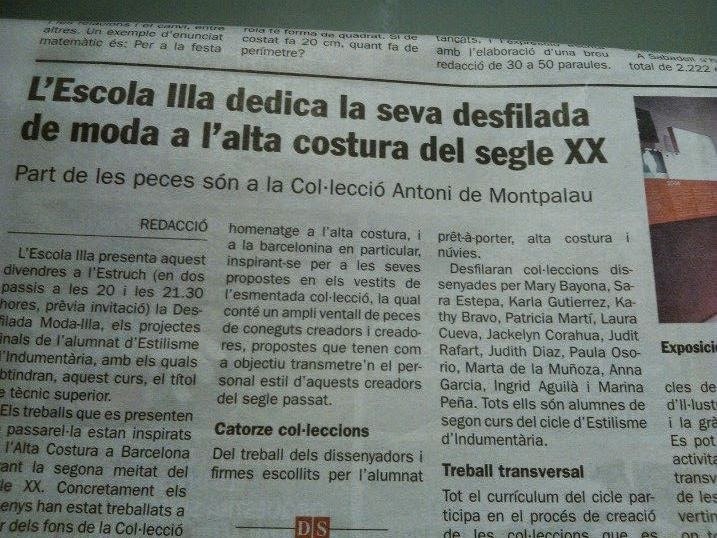 Today is the catwalk, there will be two passes one at 8 and another at 9.30, I’m super excited for this day that I can not sleep,:-P. I’m also so Happy that my name appears in the today’s press in Sabadell announcing our school, my friends and our inspiration in Haute couture from twentieth century ……. Kisses to all of you my dearest readers, we are growing step by step and I would like to thanks to all of you from the deepest of my heart, without your support this wouldn’t be possible, Thanks for your precious comment and your kindness they make feel Happy!! !